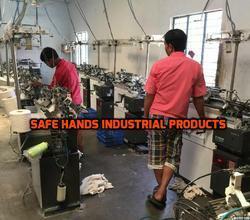 Established in the year 2014, Safe Hands Industrial Products is engaged in manufacturing, trading and wholesaling of Head Protection, Eye Protection, Face Protection, Nose Protection, Ear Protection, Hand Protection, Fall Protection, Body Protection, Feet Protection, etc. We are already working in strong alliances with a lot of companies for many years. These organizations are enormously satisfied with us because of our timely delivery, good prices and consistency in quality that we have maintained as our culture since we have evolved. We have achieved this goal only because our organization has got many experienced and skilful persons from relevant business domain. We offer our quality products at reasonable rates with prompt delivery and services. In short period, the overwhelming customer response has transformed our company into one of the leading providers of safety equipment and protection products. As we continue on the part of success, we pledge to serve the industry in the times to come. Under the supervision of our mentor Mr. Sanjay, we have carved a reckoned position for ourselves in the industry. As we continue on the part of success, we pledge to serve the industry in the times to come. More to this, our ethical terminology of business and moral drills has effectuated our market share by a large percentage. Our vision is to grow into value added products to meet and exceed the expectations of our valuable customers. We never stop exploring ways to promote the quality of our products supported by continues research and development. Our secure and systematic approach implemented in a quality system assist us in developing and delivering a flawless range of products in the market.Repeat business that our clients give to us is based on our consistency in quality and reliability that comes liberated with our product range and support. The quality controllers execute every operation and work as per the precise requirement of our valued customer and never leave stones unturned that makes customers satisfied. As our infrastructural base, we are supported by an advanced and powerful unit equipped with all necessary tools and machines, that helps us to flawless produce goods in a massive amount. It has decentralized subunits were independent operations go in a hand of our experienced staff. We have well-equipped quality control department with fully qualified and experienced staff in all departments. The quality is controlled right from raw materials to finished products at each stage of manufacture.